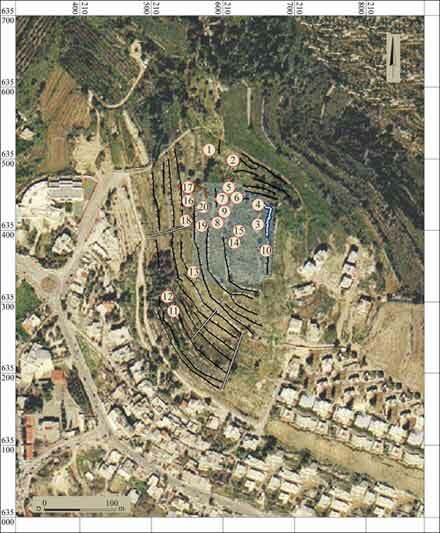 During August 2011, a survey was conducted within the precincts of the Deir esh-Sheikh antiquities site, north of Abu Ghosh (License No. S-297/2011; map ref. 210109–595/635080–781). The survey, undertaken on behalf of the Israel Antiquities Authority and underwritten by the Ministry of Interior, was performed by L. Barda and R. Greenwald (field photography), with the assistance of A. Hajian (drafting). 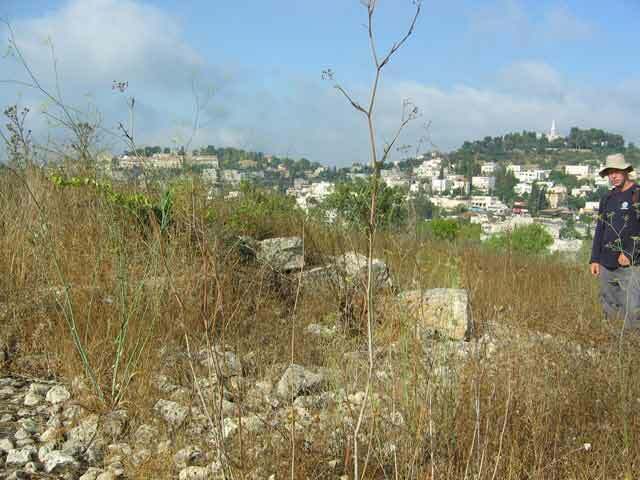 The Deir esh-Sheikh site (c. 1.2 sq km) extends across a prominent hill between Abu Ghosh and Qiryat ‘Anavim and Ma‘ale Ha-Hamisha. The site overlooks the ancient Roman road to the south, which led to Jerusalem and to a branch of this road to the west that goes up to the region of Bidu and Beit Surik. Twenty sites (1–20) were documented in the survey, including farming terraces, agricultural installations, roads, burial caves, cisterns, architectural remains and a scattering of flint artifacts. Other sites dating to different periods exist in the immediate vicinity of the site. 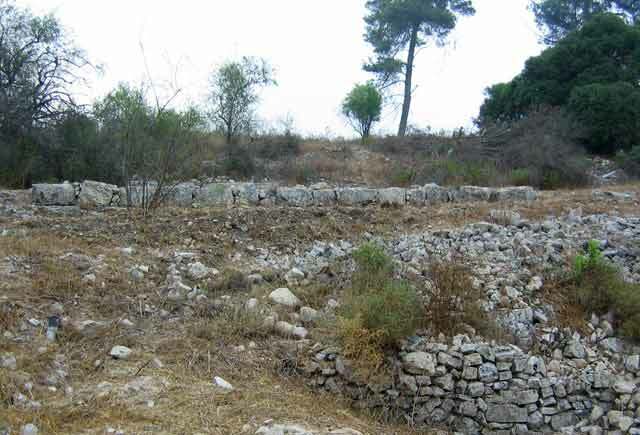 A site from the Neolithic period was excavated c. 500 m west of Deir esh-Sheikh; it extends along either side of the road that passes through Abu Ghosh (HA-ESI 119; IAA Reports 19). A site that is identified with ancient Qiryat Ye‘arim is located c. 500 m southwest of Deir esh-Sheikh. The region had previously been surveyed as part of the Map of En Kerem (101; partial publication in A. Kloner, Survey of Jerusalem, the Northwestern Sector, Jerusalem 2003). Walls and Farming Terraces (1, 3, 7, 9, 16). Many farming terraces (width 4–7 m) are evident on the hill; they are supported by retaining walls (height 0.5–1.5 m) that were built of different size fieldstones and dressed building stones; some of the terraces are covered with more ancient remains. A terrace wall in which a cistern capstone was incorporated in secondary use was documented at Site 1. A section of a wall (preserved height 1.5 m; Fig. 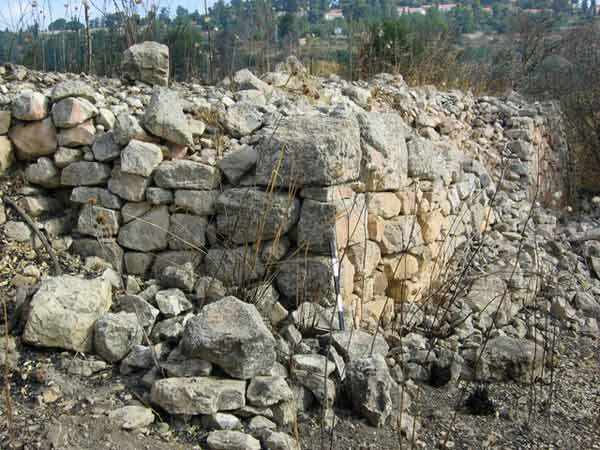 2) was documented at Site 3; it was built of dressed stones, particularly its bottom courses. The wall delimited the eastern side of an extensive enclosure at the top of the hill. Farming terrace walls (Fig. 3) were documented at Sites 7 and 16. The top of an ancient wall that might delimit a courtyard of a building situated to its south (below, Site 8) was documented at Site 9. Agricultural Installations (2, 11–13). A simple rock-hewn winepress was documented at Site 2. It consists of a treading floor and two collecting vats (1.0 × 1.2 and 1.8 × 2.0 m). A simple rock-hewn winepress that includes a treading floor and a collecting vat was documented at Site 11. A rectangular rock-hewn basin (0.9 × 1.2 m, visible depth 0.4 m) was documented at Site 12. 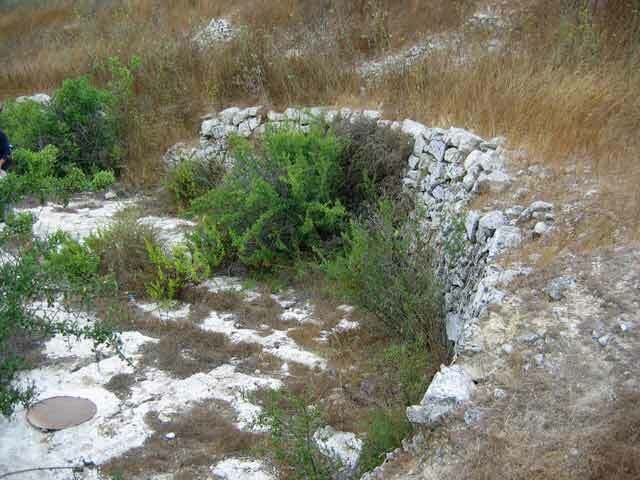 A threshing floor was documented at Site 13; it consisted of a leveled semi-circular bedrock surface (diam. 14 m; Figs. 4, 5), enclosed on the east by a wall (height 0.4–1.0 m) built of fieldstones. The threshing floor utilized most of the bedrock, except for the western part that was paved with flagstones. A shallow channel is hewn in the middle of the threshing floor. Roads (5, 6, 17). 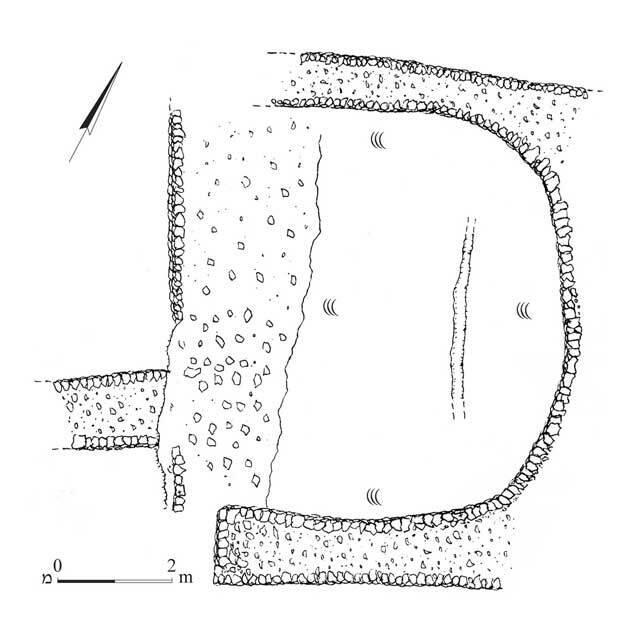 A level of small stones, delimited on the west by a row (length 6 m) of large dressed stones (0.5 × 0.7 m) and aligned north–south, was documented at Sites 5 and 6. Other stones scattered on the slope were discerned south of the row of stones. A stone lintel was incorporated in the row of stones and milestones dating to the Early Islamic period might also have been combined within it. A section of an ancient road (width 3 m), oriented east–west and leading to the middle of the hill and into the site, was documented at Site 17. The road includes a level of small stones, similar to that at Sites 5 and 6, which is delimited on both sides by walls built of one row of dressed stones. Steps built of dressed stones, whose purpose was to reduce the gradient of the road, were noted along the road. Burial Caves (18–20). 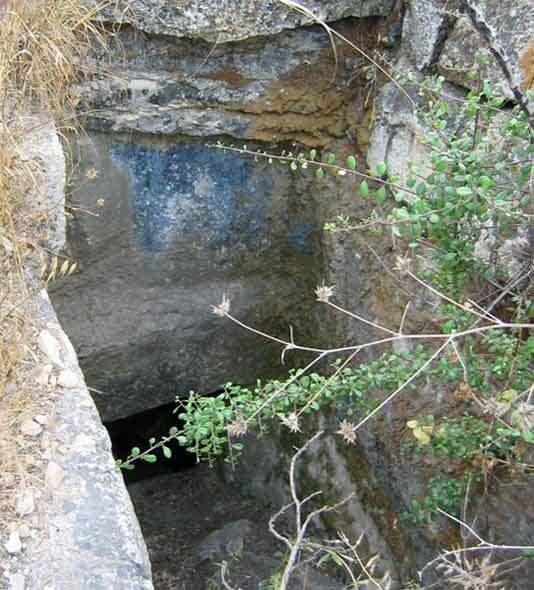 Three hewn burial caves dating to the Byzantine period were documented along the fringes of the ruin, at the top of the western slope of the hill. The caves in Sites 18 and 19 were well-preserved and built steps (Fig. 6) led to their openings. A circular roll stone was preserved in the Caves of Sites 18 and 20. Three burial niches were hewn in each of the caves. Remains of plaster containing potsherds of ribbed jars were discerned on the sides of the caves. The system of farming terraces on the slope did not damage the caves. Rock-hewn Cisterns (10, 14). A hewn shaft leads to each of the cisterns. The upper parts of the shafts are lined with dressed stones. The capstone of one of the two cisterns might have been incorporated in secondary use in the terrace wall of Site 1. Building (8). Remains of a structure built of ashlars were documented. Several of the building’s walls were preserved, including the northwestern corner that was preserved two courses high. Another ashlar-built room was discerned south of the building, and its northern wall was preserved four courses high (Fig. 7). This room might be the continuation of the building or part of another building. The eastern section of this room was covered by a later farming terrace wall. Ruin (15). Numerous potsherds from different periods, scattered on the ground, were documented at the top of the hill. It seems that this is the center of Khirbat Deir esh-Sheikh. The wall and building remains documented near the top of the hill (Sites 3, 8, 9) might be part of the buildings and enclosures located at this site, very little of which was preserved above the surface. Flint Scattering (4). The scattering included a core and flint tools from the Middle Palaeolithic period (the Mousterian culture). 2. Site 3, corner of the enclosure wall at the top of the hill, looking west. 3. Site 16, farming terrace walls. 5. Site 13, threshing floor, looking west. 6. Site 19, opening of a burial cave, looking north. 7. Site 8, architectural remains, looking south.